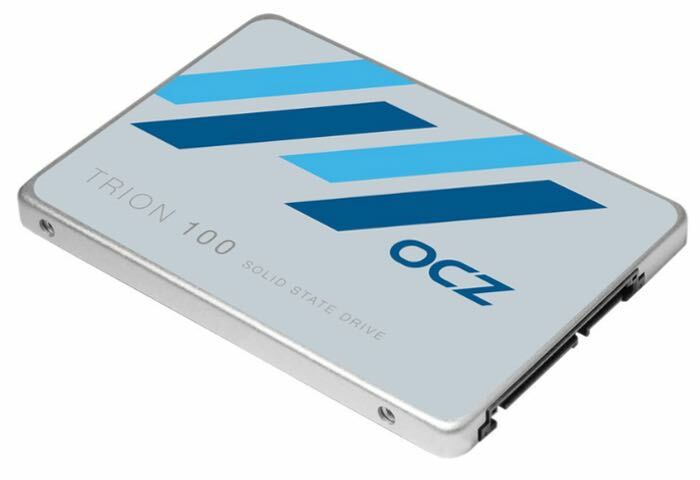 OCZ has this week launch of a new range of affordable solid state disk (SSD) drives in the form of the new OCZ Trion 100 range that are powered by a controller created by Toshiba after the company purchased OCZ last year. The new SSD range consist of four drives offering 120 GB, 240 GB, 480 GB, and 960 GB, priced at $56.99, $87.99, $184.99, and $369.99, respectively and feature 19 nm TLC NAND flash chips also made by Toshiba. The drives have been designed to provide a 2.5-inch form-factor, with SATA 6 Gb/s interface and measure 7mm thick. All drives are supplied with OCZ’s SSDGuru software that lets you monitor the drive’s health, update its firmware and format the drive when required. All four variants offer sequential read speeds of up to 550 MB/s, while the maximum sequential-write speeds are rated at 450 MB/s, 520 MB/s, 530 MB/s, and 530 MB/s, respectively. The maximum 4K random-read performance for the 120 GB variant is rated at 79,000 IOPS; while the other three offer up to 90,000 IOPS. Random-write performance figures for the four variants are 25,000 IOPS, 43,000 IOPS, 54,000 IOPS, and 64,000 IOPS, respectively. OCZ is offering a 3-year warranty with these drives. To purchase yours jump over to the official OCZ website to find a list of worldwide retailers.